The BioTek ELx800 is a sleek Absorbance Microplate Reader designed for the clinical and life science research community. The instrument is outfitted for ELISA assays, Enzyme activity projects, along with kinetic and well area scanning. The ELx800 Microplate Reader from Biotek features an extensive on-board software which includes multiple curve options, validation calculations and data transformation. In addition, the system is controlled through The BioTek Gen5 software which allows the user to set up their own assays. This microplate plate reader has the ability to read a wide range of plate from 6-384 wells. System runs off a Tungsten Halogen Lamp and has a five filter capacity. Contact us today to learn more about our Biotek ELx800 Microplate Reader. The Biotek ELx800 has been fully validated with a clean bill of health. 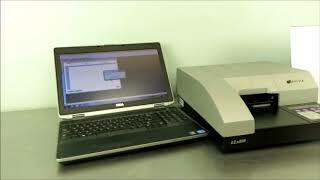 The microplate reader is in excellent condition and backed with our standard warranty. Instrument is ready to ship with a 1-3 business day turnaround time. If you have any questions don't hesitate to give us a call at 617-999-5746.